Quick overview The poems have been rendered into vigorous contemporary English. A selection of Michelangelo's letters, many of them to important contemporaries such as Vasari and Duke Cosimo, is accompanied by the 'Life' of the great artist written by his pupil Ascanio Condivi. The poems have been rendered into vigorous contemporary English. 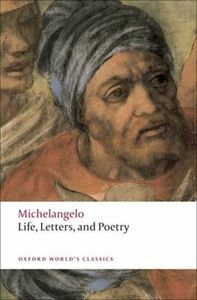 A selection of Michelangelo's letters, many of the to important contemporaries such as Vasari and Duke Cosimo, is accompanied by the 'Life' of the great artist written by his pupil Ascanio Condivi. ABOUT THE SERIES: For over 100 years Oxford World's Classics has made available the widest range of literature from around the globe. Each affordable volume reflects Oxford's commitment to scholarship, providing the most accurate text plus a wealth of other valuable features, including expert introductions by leading authorities, helpful notes to clarify the text, up-to-date bibliographies for further study, and much more.